Gelsenkirchen - 1. FC Nürnberg were condemned to their eighth relegation to Bundesliga 2 after falling to a comprehensive 4-1 defeat at FC Schalke 04 on Matchday 34. The Royal Blues secured their berth in the group stage of the UEFA Champions League next season with a display of superiority at the Veltins Arena. Joel Matip and Roman Neustädter gave them a comfortable advantage at the break before Julian Draxler struck 15 minutes from time. Josip Drmic netted a consolation, but Chinedu Obasi completed the scoring and sealed Nürnberg's fate in the process. Nineteen-year-old full-back Tobias Pachonik was given a baptism of fire, thrust into his first start for Nürnberg in their most important game of the season, in a side captained for the first time by Per Nilsson in the absence of both Raphael Schäfer and Javier Pinola. Meanwhile, Makoto Hasebe returned for the first time since Nürnberg's 0-0 draw at home to Schalke on Matchday 17, while goalkeeper Patrick Rakovsky started his first game for the visitors since November 2012. Roger Prinzen's side made the worst possible start in Gelsenkirchen when a moment of hesitation from Rakovsky allowed Matip to head in Max Meyer's corner unmarked at the near post. It was the 21st time this season der Club have conceded from a set-piece, with Matip scoring for the third time with his head this campaign. Nürnberg's season-long misfortune continued when they hit the woodwork for the 24th time through Martin Angha's cross, which came back across the face of the goal after striking the left-hand post. It was not Nürnberg's day and seemingly not their season either as Neustädter doubled the hosts' advantage right on the stroke of half time, striking a loose ball into the bottom corner with the outside of his right boot with no visiting defender in sight. These two sides' fans share a strong bond, but there was no sign of any friendship on the field, at least not from the hosts, who seemed unmoved by their guests' plight. Neustädter sent a curling shot just over before Meyer hit the woodwork as the Royal Blues edged ever closer to a third and potentially decisive goal. Nürnberg's fate had been sealed and there was to be no way back for Roger Prinzen's men under the Veltins-Arena roof. Schalke continued to coast towards victory with only the goalkeeping of Rakovsky preventing them from extending their lead further. Rakovsky's resistance was eventually broken when Draxler took aim from the edge of the penalty area and, although the Nürnberg goalkeeper got his fingertips to the ball, he could not keep it out. 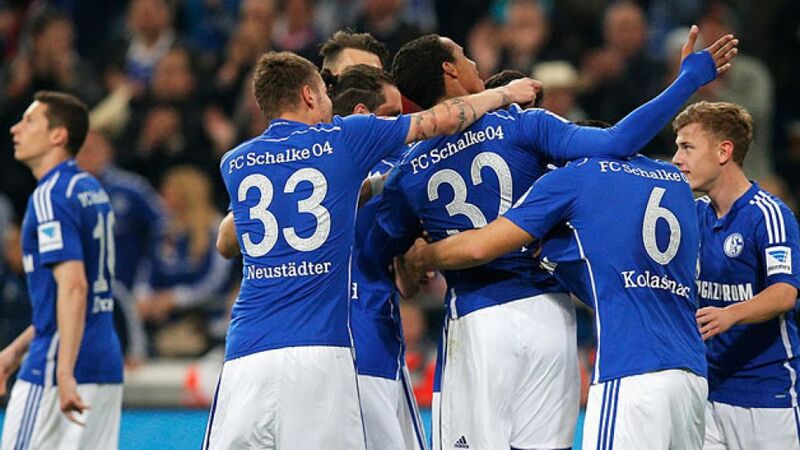 It was a goal Draxler had waited 1305 minutes for, with his last coming against Hertha Berlin on November 2. Drmic had waited almost as long to find the back of the net, and although his nine-hour barren spell ended in stoppage time when Angha's cross was parried out to him by Ralf Fährmann's leg, Obasi sealed Schalke's win right at the death.